No Turning Back - Description | W. W. Norton & Company Ltd. This astonishing book by the prize-winning journalist Rania Abouzeid tells the tragedy of the Syrian War through the dramatic stories of four young people seeking safety and freedom in a shattered country. Extending back to the first demonstrations of 2011, No Turning Back dissects the tangle of ideologies and allegiances that make up the Syrian conflict. As protests ignited in Daraa, some citizens were brimming with a sense of possibility. A privileged young man named Suleiman posted videos of the protests online, full of hope for justice and democracy. A father of two named Mohammad, secretly radicalized and newly released from prison, saw a darker opportunity in the unrest. When violence broke out in Homs, a poet named Abu Azzam became an unlikely commander in a Free Syrian Army militia. The regime’s brutal response disrupted a family in Idlib province, where a nine-year-old girl opened the door to a military raid that caused her father to flee. As the bombings increased and roads grew more dangerous, these people’s lives intertwined in unexpected ways. Rania Abouzeid brings readers deep inside Assad’s prisons, to covert meetings where foreign states and organizations manipulated the rebels, and to the highest levels of Islamic militancy and the formation of ISIS. 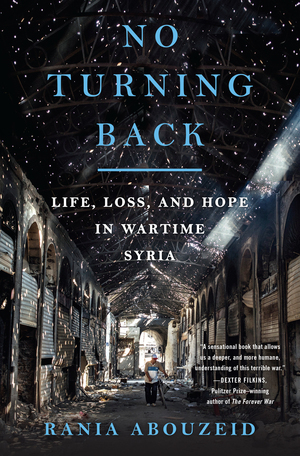 Based on more than five years of clandestine reporting on the front lines, No Turning Back is an utterly engrossing human drama full of vivid, indelible characters that shows how hope can flourish even amid one of the twenty-first century’s greatest humanitarian disasters.